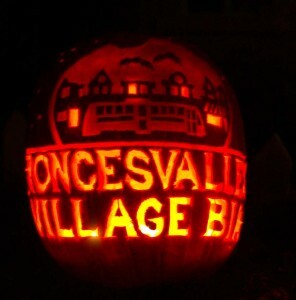 Happy Hallowe’en from everyone in Roncesvalles Village. Here’s wishing you all a safe and happy evening. From 2011, here’s our contribution to that year’s Sorauren Park Pumpkin Parade, a great local tradition, now entering its tenth year! This pumpkin was carved by local artist Chris Szynkowski. This entry was posted in ARCHIVE, Front Page, Our Neighbourhood on October 31, 2014 by Keith.